The year 2016, the anteroom to the centenary of the Russian revolutions of 1917, has already brought us several books that, in various ways, speak to the epochal events that brought down a 300-year-old regime and ushered in the utopian experiment of the Soviet Union. Most notable of these are Simon Sebag Montefiore’s engrossing The Romanovs and Historically Inevitable? Turning Points of the Russian Revolution, a collection of essays edited by Tony Brenton, a former British ambassador to Moscow. 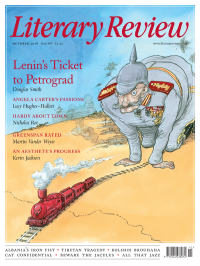 In Lenin on the Train, the distinguished historian Catherine Merridale provides one more look at this revolutionary year, retracing what she calls ‘a journey that changed the world’, the eight-day trek by rail and ferry in April 1917 undertaken by Lenin and a small band of Russian exiles from Switzerland across Germany, Sweden and Finland back to Russia. The story has, of course, been told before, most recently by Michael Pearson in The Sealed Train. Although she has not uncovered anything in the archives that substantially alters what we already know about the trip, Merridale brings to her subject a scholar’s deep knowledge and a lively narrative style. It is a work that enlightens as well as entertains. By the end of 1916, all the participants in the First World War were desperate to find some way to end the bloody stalemate. Anything that might possibly bring some advantage, no matter how unlikely its chance of success, was not to be ignored. Under the direction of Count von Brockdorff-Rantzau, Germany’s ambassador in Copenhagen, peace initiatives had already been forwarded to the Russians. The German foreign ministry spent millions on peace propaganda directed at its enemies, all to no avail. Next, the Germans looked to Russia’s revolutionary parties to help bring tsarism to its knees. They began secretly funnelling funds to them through a network of agents and spies, including the notorious intriguer Alexander Helphand, also known as Parvus. It was Parvus, in January 1915, who was apparently the first to approach the German government offering advice on how their enemy’s enemy could be put to work by encouraging upheaval at home and so speed the end of the war. Living in European exile, Lenin was stunned when he learned of the fall of the monarchy in March 1917. ‘Staggering!’ he cried to his wife, Nadezhda Krupskaya. ‘Such a surprise! We must get home.’ Here, Lenin’s and the German High Command’s wishes aligned. Lenin was desperate to get back to Russia and he began exploring every possible option for making his way across Europe. When no other country would help with his return, he accepted the German offer, after a fleeting moment of doubt about how this alliance might be interpreted by his countrymen back home. Merridale, despite the thinness of the sources, evokes with a novelist’s sensibility the atmosphere on the train. Ever the puritanical tyrant, Lenin forbade partying and banned smoking except in the lone toilet, a decision that angered his fellow passengers. Since fomenting revolution required rested bodies, he placed everyone on a strict sleep schedule. A line of chalk was drawn on the floor of the carriage, demarcating the space of the exiles from that of their German guards; only one member of the party, from a neutral country, was permitted to move between the two zones. As the others waited their turn for a smoke in the lavatory, Lenin toiled away, writing like mad and holding meetings with his colleagues. Lenin was met by a jubilant crowd upon his arrival at Petrograd’s Finland Station. ‘Apart from peace and bread,’ Merridale writes, ‘the one thing people yearned for most was something new: an end to the old ways, the lies, the government by strangers in expensive suits.’ Lenin told them they had been betrayed, that the revolution had opened ‘a new epoch’ and before them lay ‘the worldwide socialist revolution!’ Merridale correctly notes how ‘his slogans felt like a sudden electric shock … a call to life, a blinding glimpse of futures some had privately begun to doubt’. The masses chose to ignore the fact that Lenin had called not for peace, but rather for an end to the ‘imperialist war’ and the unleashing of a new ‘civil war’ along class lines. Russia’s Provisional Government tried to discredit Lenin by portraying him as a German agent. The charges have had a long life. In the early 1990s, Dmitri Volkogonov claimed to have found incontrovertible proof in recently declassified Russian archives that the father of the Soviet state had been in the direct pay of the Germans, an accusation that Merridale shows to be baseless, although at the same time she does acknowledge that some of the millions of German marks given to Parvus probably made their way to ‘Lenin’s fighting fund’. Against the background of war and the collapse of the Romanov regime, treason was the brush used to paint every perceived enemy. In the final years of Nicholas II’s reign, spy mania swept over Russia like a prairie fire. It was this paranoia that gave rise to the notorious Myasoedov affair, when an innocent Russian officer was arrested and executed without any real evidence. It was also this paranoia that led most Russians to believe, again mistakenly, that Grigori Rasputin, the holy man and confidant of the tsar and tsarina, was a German agent and the man responsible for the army’s defeats. Lenin accepted German help, but this made him no more an agent than Georgi Plekhanov, the ‘father of Russian Marxism’, who was sent back to Russia by Great Britain around the same time to agitate on behalf of the Provisional Government in favour of staying in the war. It was not only the Germans who made use of Trojan horses, Merridale rightly notes. At base, the arguments over Lenin centre on the question of the legitimacy of the October Revolution, for if Lenin was working on behalf of Russia’s enemy, then the Revolution itself becomes a foreign conspiracy, one brought about with the aid of a fifth column. Now, a century later, the absurdity of such a notion is beyond doubt, but during the fog of revolution, when reliable information was in short supply and all of Petrograd survived on a diet of rumour and gossip, no one could be sure of anything. It is this atmosphere of confusion, uncertainty and fear that Helen Rappaport captures in her latest book. Drawing on a range of largely forgotten published sources and a number of archival collections, including several in the United States, Caught in the Revolution resurrects the voices of the many British and American citizens then living in Petrograd as they experienced the Revolution first-hand. Diplomats, aid workers, journalists, businessmen and political activists recorded their experiences in letters, diaries and memoirs that paint a picture of a city that, after an initial burst of joy and optimism, quickly descended into frightening chaos. It is a testament to the extent of the anarchy that Phil Jordan, the valet and chauffeur to the American ambassador, could complain that there were ‘only two decent places to live: one is heaven, the other is America’. And these were the words of a black man from a country then convulsed with racial violence. The strength of Rappaport’s work is the immediacy it provides, the sense of what it was like to experience the Revolution, albeit for a small group of well-off and educated foreigners. Twenty-five years ago, hardliners within the Soviet government staged a coup against Mikhail Gorbachev and his reforms. The opposition forces in Moscow flocked to the White House in support of Russian president Boris Yeltsin. Two days later the coup collapsed. I was in Moscow during those days and recall the sense of fear followed by hope that swept through the capital. Not unlike with the fall of the Romanovs, there was a sense that Russia’s dark past was behind it and that a new, freer Russia could be glimpsed on the horizon. The vision proved to be a chimera then, just as it had almost a century earlier.